© I Am An Experiment. All Rights Reserved. Truth is often stranger than fiction. I Am An Experiment is a true, unique and universal story. In it Ashtara shares her life transforming experiences of multi-dimensional space travel and interactions with, and training by, celestial and extra-terrestrial light beings. Journal entries written between the years 1993 to 2000 formed the foundation for her story. Ashtara offers a brilliant glimpse of infinity, universal order and humanity’s spiritual evolution. The teachings contained within the book awaken soul memories and provide helpful explanations and answers to many of life’s soul-searching questions. Her inner teachers asked that she record and share her experiences. She does so in the belief that her story will open the hearts and minds of readers to a higher love-based reality, and invoke a curiosity about seemingly impossible experiences. Would you be willing to travel into unchartered realms of consciousness to further your spiritual evolutionary path? The book is also a guide to assist the healing of ancient soul wounds and forms a bridge between the consciousness of the past and that of the future. Ashtara’s real life adventure story shows that life itself can often be stranger than fiction. If one reads this book with an open and non-judgmental mind then it has the ability to open doorways into a new reality that can offer an alternate explanation into the purpose of human existence. Ashtara has shown incredible bravery by sharing this inner journey with a world that describes all that is not seen by the eye as fantasy. By doing so her story will become a lifeboat to many who have experienced similar inner realities and who have suffered torment when speaking of it to others. Anyone who spends time with Ashtara will see that she is a very down to earth and practical woman who has been able to balance an extraordinary inner life with an outer life that has involved both business and community service. I believe this stability has enabled her to view these life experiences with the mindset and detachment of the scientist, being neither swayed nor overcome by the things she has experienced. I Am An Experiment is a truthful documentation and unabridged version of these experiences. 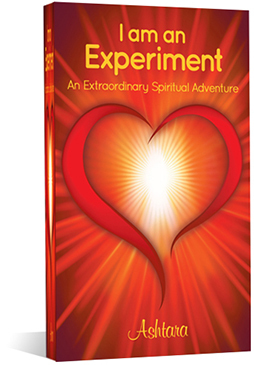 This book will appeal to open minded seekers on the spiritual path. Many people will see the truth in Ashtara’s telling of her life and will respond to her as a kindred spirit who has personally experienced and travelled through the unseen worlds documented in many of the ancient and archaic texts. Not all people will wish to consider that the information contained in this book could represent an undeveloped side of our human nature, however, it will certainly open the doorway for lively discussion and experimentation into it’s possibilities. I Am An Experiment is an exciting and very informative read. Lyndall White, B.A.H.Sc, M.A. Visual Art, Adv Dip Homeopathy, Post Grad Psych. This is an extra-ordinary true adventure documented by Ashtara, the author, where she inter-dimensionally journeys into the Celestial Realms with Extra-terrestrial beings and Highly Ascended Masters. Ashtara´s experiences certainly will amaze and stretch your thoughts and imagination on what is actually possible to achieve whilst in a human form! Her abilities to remote view, bi-locate and connect telepathically are beyond fascination and make valuable reading and understanding. It is my recommendation to use this book as an on-going reference tool. I have read this twice so far and different aspects caught my attention the second time of reading. There is so much information detailed very personally at times, it was a pleasure to read and will continue to be a pleasure as this book is filled with lots of love and light and with the intention to guide and open our awareness to the endless possibilities of communication beyond our limited consciousness. An invaluable guide based on such extra-ordinary adventures and therefore should take pride of place on your bookshelf. As Ashtara recommends in the Introduction, it is, indeed advisable to fasten your seat belts as you prepare to join her on this remarkable journey into unchartered starry realms. I am truly grateful to Ashtara for sharing this particular time period of her life and so pleased she agreed to be an Experiment for us all to benefit and learn from. This book of memoirs touched my heart……..Thank you! “I read your wonderful, amazing, inspiring, courageous and healing book and then immediately had to read it again.I Am An Experiment deserves to be read several times because it has so much substance, experience, depth and meaning in it”. 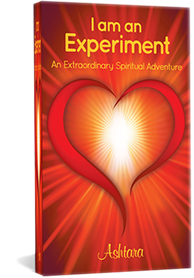 “The awesome journey you took me on through your book I Am An Experiment was exciting, filled with wonder and opened my mind even further to the knowledge that we are indeed, unconsciously, loved and cared for by unseen intelligences. Thank you so much, Ashtara, for the privilege of reading your journals in this book’s form. It helped me understand the value of journaling. I admire your courage, determination and commitment to your life’s journey and wish you much happiness and good fortune with your future books”. A tear in the window of illusion – A peep into the future for mankind. An adventure that is real, showing us that we are far more than our physical reality, we are spiritual beings capable of living in the realms of light, transforming the human dimension with our visions. These statements and many more can be said for this extraordinary spiritual adventure, I Am an Experiment. Ashtara is a way-shower, a bridge builder and a hope giver to those hearts crying in a wilderness, seeking greater spiritual understanding. Ashtara asked and was given many tools to assist in healing the deep pain and angst we create, that only we, as an individual, can heal. Ashtara did the healing, taught others and so has personally had the experience on many levels of the truth within the teachings she has learnt through hard work and personal adventure. Thank you Ashtara from my heart, I cannot wait to read more for I believe your books are not just for the now but future texts offering guidelines to tomorrow’s children. Ashtara is an Australian astrologer. She writes and teaches from an astrological, spiritual, esoteric and metaphysical perspective. Her aim is to raise human consciousness. For a paperback, current Australian postage rates apply. © I am an Experiment All rights reserved.